The combination of cheeses gives this dish extra richness and flavor. 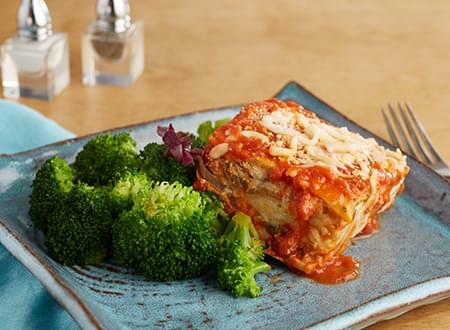 Together with the tender flavor of oven roasted vegetables, our Roasted Vegetable Cheese Lasagna is pure comfort food. 5 oz. portion in 2 oz of sauce. SUMMER SQUASH, ZUCCHINI, MUSHROOM, EGGPLANT, ROASTED RED PEPPER, PARSLEY, RICOTTA CHEESE, LASAGNA PASTA SHEETS, MOZZARELLA CHEESE, EGG, PARMESAN CHEESE, TOMATO SAUCE( PLUM TOMATOES, ONION, GARLIC, CRUSHED RED PEPPER, BASIL, KOSHER SALT).